Odeo, an early podcasting startup that has long struggled with its direction, is back, in beta and looking for feedback. 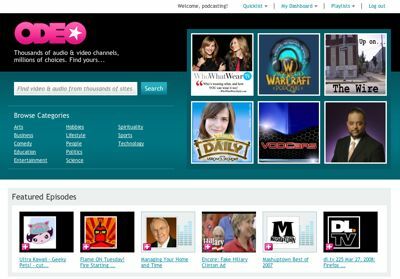 While the original site focused on podcast creation, the focus of Odeo’s latest incarnation focuses on viewing and listening to Internet media. Give it a look and let me know what you think of the makeover! I’ve emailed them and they say that the odeo studio will be included when they go live as well. I’m really looking forward to that coming back. That was my favorite part of the site. We’ll see i guess. what a big disappointment the new odeo beta is- on my end (three weeks now) its not worth spending another second on. -new user interface lacks in intuitive controls. -help menu is not very helpful, its lack much needed. this ship will fade because its rubish! how are people seeing it? I signed up to have a look over a month ago and still can’t get in. I would love to have a look though, is there some direct link or something? Tried Odeo out using Explorer and it froze the browser, nice job! Tried Odeo out using FireFox and it choked so bad just loading and playing back a simple QT feed that I will now officially forget the name Odeo. Who’s in charge over there? Their about section is as cryptic as you can get (for good reason I suppose). Oh well, back to Miro. If they’re able to clean up these bugs and restore the semi-decent production tools that had previously existed in the old Odeo Studio, I’ll be the first to offer kudos, but I think it was a major blunder not to have had these capabilities in place before launching the redesigned site.